After using my C-bot for a while I’ve always been a little frustrated that I can’t keep the mini V wheels all tightly aligned to the rails. Usually I can freely turn one of the four wheels which means that every wheel is not tight against the rail. 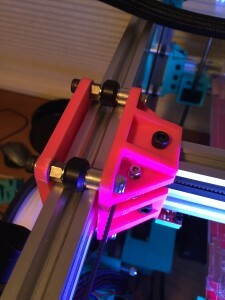 The original C-Bot printer design uses little plastic ramps that cause the bolt to press towards the rail as you tighten the bolt, this can work in general but doesn’t allow you fine control of how tightly the wheels are pressing on the rail that they are sliding along. If the wheel is too tight you get too much friction and the bar doesn’t roll smoothly. Too loose and you introduce slop and vibration during your 3d prints. 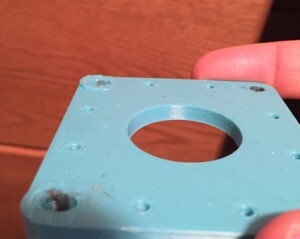 To allow for more precise adjustment I’ve started using 6mm eccentric spacers from OpenBuilds Part store, these work because the center hole is drilled offset from center and allows you to adjust how tightly each wheel rests against your V-rail by rotating the spacer with a small wrench. You only need the eccentric spacer on one side of each axis carriage, so for my printer each assembly has four wheels and I only use two eccentric spacers, one each for the top two wheels. 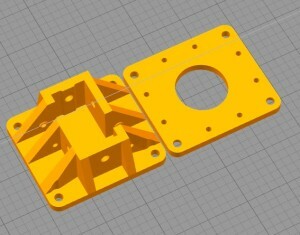 This modification is fairly cheap, the most difficult part is printing out new parts that have the proper opening for the new spacer. I’ve only modified the X-carriage and Y-carriage so far but I’m very pleased with the results. The rail seems to roll much more freely but without any slop. I will eventually modify the Z axis as well.